7 Awesome Stats from NFL Week 11 - Fantasy Football, Fantasy Football Rankings | Mac Bros.
Week 11 of the NFL season has nearly come and gone. Let's look back at 7 feats of statistical awesomeness. 1. New Orleans’ DREW BREES (3,326 yards, 23 touchdowns), Green Bay’s AARON RODGERS (3,168 yards, 31 touchdowns) and New England’s TOM BRADY (3,032 yards, 23 touchdowns in nine games) have all passed for at least 3,000 yards and 20 touchdowns in their team’s first 10 games (Brady and the Patriots play their 10th game on Monday night). This is the first time in NFL history that three different quarterbacks have passed for at least 3,000 yards and 20 touchdowns in their team’s first 10 games. 2. The GREEN BAY PACKERS defeated Tampa Bay 35-26 and improved to 10-0. The Packers have won a franchise-record 16 consecutive games (including the playoffs) and are the third defending Super Bowl champion to start the following season 10-0 (1990 San Francisco 49ers and 1998 Denver Broncos). The Packers are 10-0 for the third time in franchise history (1929 and 1962). Green Bay won the NFL Championship in both of those seasons. 3. The DETROIT LIONS erased a 24-7 deficit to defeat Carolina 49-35. The Lions are the first team in NFL history to win three games in a single season in which it trailed by at least 17 points. The Lions won games in Weeks 3 (20-point deficit vs. Minnesota) and 4 (24-point deficit vs. Dallas) after trailing by at least 17 points. 4. Green Bay QB AARON RODGERS completed 23 of 34 passes (67.6 percent) for 299 yards with three touchdowns and one interception for a 112.3 passer rating in the Packers’ win. 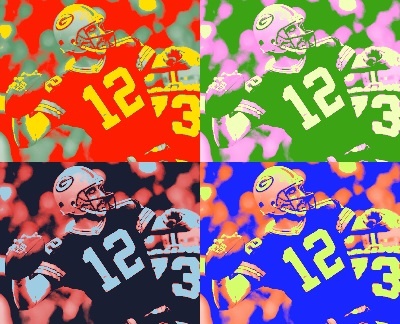 Rodgers is the first quarterback to record a passer rating of at least 100 in 10 consecutive games in a single season. He had previously been tied with PEYTON MANNING (nine in 2004) for the longest such streak. Rodgers has passed for at least two touchdowns in all 10 games this season and is the fifth quarterback in NFL history with multiple TD passes in each of his team’s first 10 games. The other four quarterbacks to accomplish the feat are Pro Football Hall of Famers JOHNNY UNITAS (1959) and DAN MARINO (1984) and PEYTON MANNING (2004) and TOM BRADY (2007). 5. Detroit quarterback MATTHEW STAFFORD threw five touchdown passes in the Lions’ win. It is Stafford’s second career five-touchdown game and he is the first quarterback in the Super Bowl era to pass for at least five touchdowns two times in his first 23 career starts. 6. Here are two stats on rookie quarterbacks CAM NEWTON and ANDY DALTON. Carolina’s Newton rushed for two touchdowns in the Panthers’ loss at Detroit. Newton now has nine rushing touchdowns, the most rushing TDs by a rookie quarterback in a season since 1970. Newton had been tied with VINCE YOUNG, who rushed for seven touchdowns as a rookie in 2006. Cincinnati’s Dalton passed for 373 yards and one touchdown in the Bengals’ loss at Baltimore. Dalton has 15 passing touchdowns, tied with Pro Football Hall of Famer DAN MARINO (1983) and PEYTON MANNING (1998) for the most by a rookie through a team’s first 10 games since the 1970 merger. 7. Baltimore rookie wide receiver TORREY SMITH had six catches for 165 yards and a touchdown in the Ravens’ 31-24 win over Cincinnati. Smith joins KEN BURROW (two in 1971) and RANDY MOSS (three in 1998) as the only rookies to have multiple games with at least 150 receiving yards and a touchdown catch since 1970.